When Joyce Xi graduates from college next week, I hope the celebratory pride and joy she and her family experience will be so tremendous, it will blast away the cloud of suspicion and shame that has hovered over them the last year, once and for all. That’s always the hope when you come to a “good” life event. The family has had to endure a “bad” one that began May 21, 2015. That’s when the world changed for Joyce’s father, Dr. Xiaoxing Xi, and the entire Xi family. It was the year of being falsely accused of spying. If you saw Dr. Xi on “60 Minutes,” then you saw him pantomime exactly what happened nearly a year ago when the F.B.I. visited the family’s suburban Philadelphia home. With guns drawn, agents vigorously knocked on the front door, then cuffed and arrested the physicist as his family stood by in disbelief. Dr. Xi, a naturalized Chinese American citizen, and, at the time, head of the physics department at Temple University, was accused of spying for China. And even though the charges were dropped last September, the emotional pain of the experience hasn’t dissipated at all. As I talked to Joyce, I couldn’t help think of Wen Ho Lee, the Taiwanese American who worked at Los Alamos Laboratories and was accused of transferring nuclear secrets to China in 1999, and his daughter Alberta. Lee was arrested, detained for nine months, sometimes in solitary confinement. But then the government’s espionage case fell apart, and _The New York Times_, which had led the media drumbeat against Lee, published a semi-mea culpa. It wasn’t quite an apology for racial profiling, but it was a soft admission of the Times‘ reporting flaws, an over-reliance on government sources, and the harsh, accusatory tone it used in stories about Lee. I remembered that line when I talked to Joyce Xi the other day. So here’s a humanizing fact. Who wins? She says she does. But in the strategy game, they both share a scientific approach to things. Though she’s more chemistry than physics, she admits to taking after her father. Joyce’s too. And that’s been the troubling thing about the facts in her father’s case. She said she’s not sure why the case was even brought forward. She wonders why the government didn’t consult an independent scientific expert who actually understood the science before they prosecuted her father. But we’re not dealing with science here, just politics. 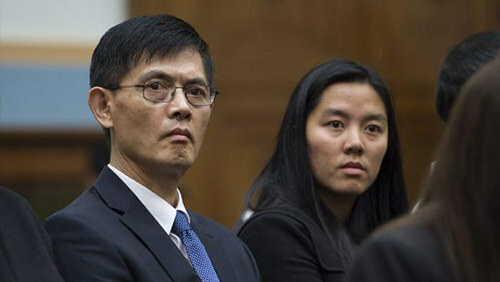 Members of Congress already called for an investigation and an apology last year, when the charges against Xi and another Chinese American scientist, Sherry Chen, were dropped. Although the Justice Department dropped the charges against Chen, her employer, the National Weather Service, fired her. In response, Chen has since filed a discrimination complaint. But nothing seems to have changed to prevent more racial profiling against Asian American scientists. Earlier this year, the Justice Department did issue a letter to its prosecutors that all future national security cases like Xi’s will be directed by more experienced officials in Washington. Community activists don’t think that’s enough to protect future innocent people. And it’s not good enough for those who’ve been through the wringer, like Joyce Xi. She’s leading a public petition drive calling for an independent investigation and a formal apology for her father and other Asian Americans who have been wrongly accused.